You’ve bought your first house and you love it, but you’d be lying if you said it doesn’t need some work. But you’ve already stretched your funds to buy the house, and you don’t have a lot to spare for home renovations. While there are some projects you should reserve for the pros, you don’t have to accept your house as-is while you save up. These five affordable projects have a big impact on your home’s livability, and you can do them all yourself. As long as you’re not changing their location, it’s relatively simple to swap out light fixtures. Older fixtures can majorly date your home, especially standard dome lights. Why not try an industrial-chic pendant light, statement chandelier, or minimalist lantern instead? Or, you can create your own unique fixture with inspiration from from Freshome. If you don’t feel comfortable replacing light fixtures you can opt to hire an electrician to install the fixtures for you. According to HomeAdvisor, hiring an electrician in Nashville will run between $137 - $417; a small price to pay for your safety. Is there vintage hardwood or cool tilework hidden under those frayed and faded carpets? If there is, you’re probably better off tearing up the carpet and refinishing what’s underneath. Not only is carpet more work to clean and maintain, but those old floors are a great way to add character to your home. 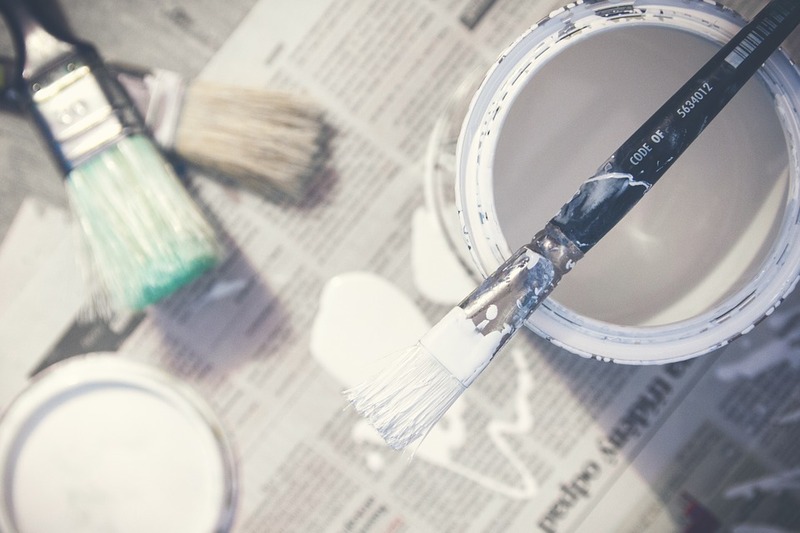 Whether you want to add some funk, take gaudy paint colors down a notch, or just get rid of scuffs and scratches, repainting is a great way to give your home a fresh feel. Rather than moving furniture so you can paint, consider tackling this project before you move in. Since your cabinets take up a lot of real estate in your kitchen, their look is a central part of the room’s overall style. That means if your cabinets are outdated, your whole kitchen looks outdated. Give builder-grade cabinets a facelift with these great ideas from Curbly. Is any home design feature a bigger eyesore than ugly vinyl floors? If replacing vinyl flooring isn’t in your budget right now, you can still change its look by painting over it. Add a fun pattern to your laundry room floor or go solid to modernize the kitchen. It might wear off eventually, but by then you should be able to replace the flooring with some cool tile, minimalist cork, or another modern choice. Protect your ears, eyes, and feet by always wearing safety goggles, ear muffs or plugs, and closed-toe shoes while working with power tools and heavy equipment. Practice safe power tool handling. Don’t wear loose clothing while using power tools, keep your hands out of the tool’s path, and never leave a power tool unattended when it’s active. Be aware of your surroundings. Keep children and pets out of the area you’re working in and close doors when leaving the project unattended. Leave electrical work, plumbing, roofing, and structural repairs to the professionals. These projects are unsafe to DIY — both for you, and your house. Any project that could seriously injure you or ruin your home’s value should be hired out. As these projects show, there’s a lot you can accomplish without ruining your finances, or worse, your home. Keep your DIY efforts within your ability and take basic safety precautions, and you’ll be amazed at what you can accomplish with a small budget. So what are you waiting for? Now that you own your first house, it’s time to make it a home. This article was provided by Bret Engle from DIYGuys.net .